13 / 12 DSLR datasets for training / testing. 5 / 5 multi-cam rig videos for training / testing. 27 / 20 frames for two-view stereo training / testing. Use left mouse button to rotate, right to translate. May not work in mobile browsers. 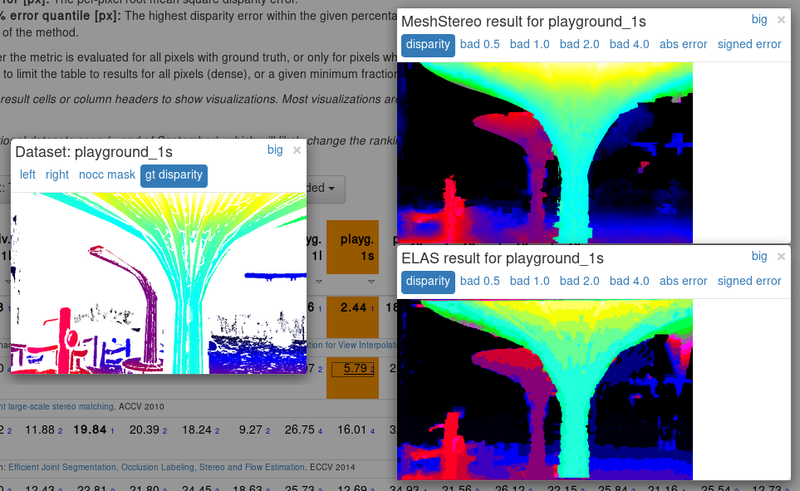 Depth maps comparison example (screenshot). This webpage presents a multi-view stereo / 3D reconstruction benchmark covering a variety of indoor and outdoor scenes. Ground truth geometry has been obtained using a high-precision laser scanner. A DSLR camera as well as a synchronized multi-camera rig with varying field-of-view was used to capture images. For a detailed description of the data and the format in which it is provided, see Documentation. For downloading the datasets, go to Datasets. Open source code related to the benchmark is available on GitHub. The ETH3D benchmark is a part of the Robust Vision Challenge. This list is a summary, more details are available in the changelog. 2018-04-16: Added pre-rendered depth maps for training datasets for convenience. 2018-02-05: Open source release of the dataset pipeline. 2017-10-04: Extension with more data. 2017-07-19: Initial release of the dataset. The data provided here is licensed under the Creative Commons Attribution-NonCommercial-ShareAlike 4.0 International License.